The incidence of diabetes in the US population has increased more than fourfold over the last several decades and a high proportion of these patients manifest diabetic eye disease, including diabetic retinopathy (DR) and diabetic macular edema (DME). Ultra-widefield (UWF) retinal imaging has emerged as a valuable tool in the evolving standard of care for DR, providing essential visualization of ischemia and related pathology across the retina, particularly in the periphery, where these signs may appear earliest but may not be detected by conventional fundus photography. Multimodal UWF imaging has helped correlate changes in the periphery with DR progression, providing important guidance for treatment planning and facilitating improved understanding of the underlying mechanisms of disease. Rapid capture, immediate retrieval and efficient sharing of UWF retinal images support a wide spectrum of care settings—including teleophthalmology programs—and facilitate patient education. David M Brown is a consultant for Heidelberg, Optos, Optovue, and Zeiss. The publication of this article was supported by Optos. The views and opinions expressed are those of the author and do not necessarily reflect those of Optos. In 2014, approximately 8 million Americans with diabetes were undiagnosed, making the total incidence of the disease in the US more than 29 million, or 9.3% percent of the population.4 Analyses based on data collected a decade ago in the National Health and Nutrition Examination Survey (NHANES) suggest that nearly a third of all adults with diabetes in the US had signs of DR. This rate was even higher among specific populations of diabetic patients, with more than a third of Mexican Americans and nearly 40% of African Americans having diabetic eye disease. Patients in these groups were also more likely to present with severe disease and vision loss. Overall, an estimated 4.2 million adults had DR at that time and 655,000 had disease severe enough to be vision threatening.5 Given the data showing that the at-risk population has continued to grow at a similar rate, the clinical community must take aggressive action toward earlier identification and treatment of patients with DR. Meeting this challenge requires improved access to screening and referral as well as enhanced strategies for earlier detection, evaluation, treatment, and assessment of treatment success. In this setting, digital, multi-modality ultra-widefield (UWFTM) retinal imaging (Optos, plc., Dunfermline, Scotland) provides a technological cornerstone for the evolving standard of care. With a single, non-contact capture, UWF retinal imaging allows high-resolution visualization of up to 82%, or 200 degrees, of the retina (producing the digital optomap®), displaying the most retinal surface area of any available imaging system.6 Optos systems incorporate a proprietary scanning laser ophthalmoscope (SLO) and ellipsoidal mirror, engineered specifically for UWF imaging. The SLO utilizes two low-power lasers that scan the retina simultaneously, with the green ‘red free’ wavelength (532 nm) permitting visualization of the sensory retina to the retinal pigment epithelium (RPE) and the red wavelength (635 nm) reaching deeper structures from the RPE to the choroid. The latest generation Optos UWF platform, California, utilizes enhanced optical hardware and software to improve resolution during scanning, producing clear, high-resolution images of virtually the entire retina. The automatic montage feature increases the field of view in many eyes to greater than 95%.7 California provides multi-modality imaging options including color, autofluorescence (AF), fluorescein angiography (FA), and indocyanine green angiography (ICG). Insurance Portability and Accountability Act (HIPAA)-compliant image sharing and cloud storage. This ease of image sharing is particularly useful in referral situations or teleophthalmology settings. In addition to efficient evaluation and annotation by the clinical team, a single optomap or historical comparisons can be reviewed with the patient without delay during the office visit on a computer screen or tablet. While diabetes affects small blood vessels all over the body, DR is often the first manifestation of end-organ disease that can be detected. Many patients with diabetes are non-compliant with blood sugar control and are in denial that this is detrimental to their physical health and end organs. We have found that counseling a patient on improving blood sugar control while demonstrating with UWF imaging that damage is already occurring in their peripheral retina is often a very effective and convincing approach to education and behavior modification. We review the optomap with the patient and their care partners, pointing out microaneuryms and capillary non-perfusion. We advise them that if damage is occurring in the retina, then it is also happening in the heart, the kidneys, the brain, and throughout their body. In our experience, the immediacy of this vivid demonstration of the impact of their lack of adherence on the blood vessels in their body, particularly if historical comparison has indicated progression, helps patients and their loved ones realize that they need to become more serious about glycemic control and other aspects of their treatment plan. The dramatic increase in the incidence of diabetes and associated eye disease will continue to pose a challenge for the clinical community. In this environment, UWF retinal imaging is valuable for effective screening, refinement of treatment decision-making, and advancement of our understanding of the disease process itself. By facilitating earlier diagnosis, earlier treatment, and more effective patient education, UWF retinal imaging is helping to shape the new standard of care for DR that will preserve vision for more of our patients with diabetes. 1. Bourne RRA, Stevens GA, White RA, et al., Causes of vision loss worldwide, 1990-2010: a systematic analysis, Lancet, 2013;1:e339–e349. 2. Lee R, Wong TY, Sabanayagam C, Epidemiology of diabetic retinopathy, diabetic macular edema and related vision loss, Eye Vis, 2015;2:17. 3. Centers for Disease Control and Prevention, National Center for Health Statistics, Division of Health Interview Statistics, data from the National Health Interview Survey. Available at: www.cdc.gov/ diabetes/statistics/prev/national/figpersons.htm (accessed March 13, 2017). 4. Centers for Disease Control and Prevention, National Diabetes Statistics Report: Estimates of Diabetes and Its Burden in the United States, 2014, Atlanta, GA: US, Department of Health and Human Services, 2014. 5. Zhang X, Saaddine JB, Chou C, et al., Prevalence of diabetic retinopathy in the United States, 2005-2008, JAMA, 2010;304:649–56. 6. Witmer MT, Parlitsis G, Patel S, et al., Comparison of ultra-widefield fluoresceuin angiography with the Heidelberg Spectralis® noncontact ultra-widefield module versus the Optos® Optomap®, Clin Ophthalmol, 2013;7:389–94. 7. Optos. Data on file. 2017. 8. 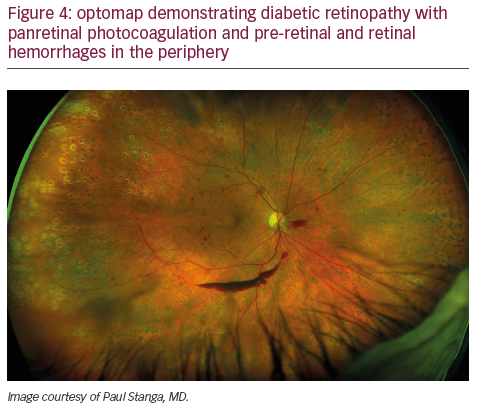 Kaines A, Oliver S, Reddy S, Schwartz SD, Ultrawide angle angiography for the detection and management of diabetic retinopathy, Int Ophthalmol Clin, 2009;49:53–9. 9. 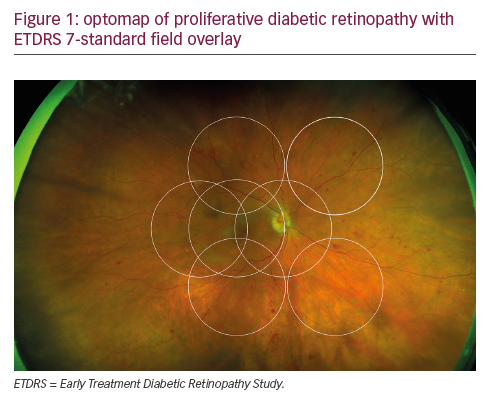 Kernt M, Hadi I, Pinter F, et al., Assessment of diabetic retinopathy using nonmydriatic ultra-widefield scanning laser ophthalmoscopy (optomap) compared with ETDRS 7-field stereo photography, Diabetes Care, 2012;35:2459–63. 10. Kernt M, Pinter F, Hadi I, et al., Diabetic retinopathy: comparison of the diagnostic features of ultra-widefield scanning laser ophthalmoscopy Optomap with ETDRS 7-field fundus photography [article in German], Ophthalmologe, 2011;108:117–23. 11. 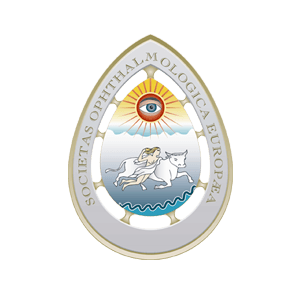 Silva PS, Cavallerano JD, Sun JK, et al., Nonmydriatic ultrawide field retinal imaging compared with dilated standard 7-field 35-mm photography and retinal specialist examination for evaluation of diabetic retinopathy, Am J Ophthalmol, 2012;154:549–59. 12. 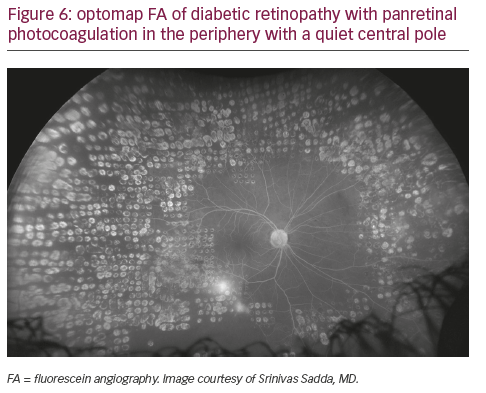 Wessel MM, Aaker GD, Parlitsis G et al., Ultra-wide-field angiography improves the detection and classification of diabetic retinopathy, Retina, 2012;32:785–91. 13. Kong M, Lee MY, Ham DI, Ultrawide-field fluorescein angiography for evaluation of diabetic retinopathy, Korean J Ophthalmol, 2012;26:428–31. 14. Silva PS, Cavallerano JD, Sun JK, et al., Peripheral lesions identified by mydriatic ultrawide field imaging: distribution and potential impact on diabetic retinopathy severity, Ophthalmology, 2013;120:2587–95. 15. 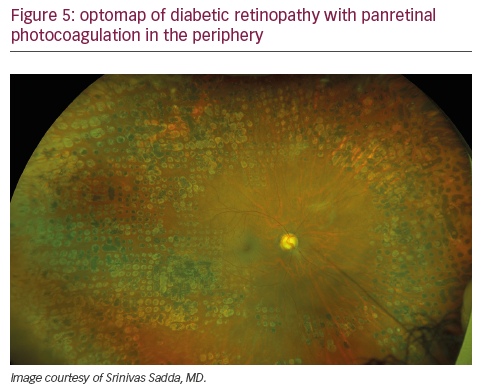 Manjunath V, Papastavrou V, Steel DHW, et al., Wide-field imaging and OCT vs clinical evaluation of patients referred from diabetic retinopathy screening, Eye, 2015;29:416-23. 16. Silva PS, Cavallerano JD, Tolls D, et al., Potential efficiency benefits of nonmydriatic ultrawide field retinal imaging in an ocular telehealth diabetic retinopathy program, Diabetes Care, 2014;37:50–5. 17. 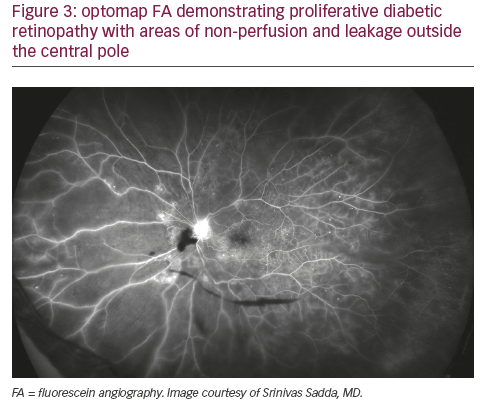 Silva PS, Horton MB, Clary D, et al., Identification of diabetic retinopathy and ungradable image rate with ultrawide field imaging in a national teleophthalmology program, Ophthalmology, 2016;123:1360–7. 18. Silva PS, Dela Cruz AJ, Ledesma MG, et al., Diabetic retinopathy severity and peripheral lesions are associated with nonperfusion on ultrawide field angiography, Ophthalmology, 2015;122:2465–72. 19. Takamura Y, Tomomatsu T, Matsumura T, et al., The effect of photocoagulation in ischemic areas to prevent recurrence of diabetic macular edema after intravitreal bevacizumab injection, Invest Ophthalmol Vis Sci, 2014; 55:4741–6. 20. Wessel MM, Nair N, Aaker GD, et al., Peripheral retinal ischaemia, as evaluated by ultra-widefield fluorescein angiography, is associated with diabetic macular oedema, Br J Ophthalmol, 2012;96:694–8. 21. Patel RD, Messner LV, Teitelbaum B, et al., Characterization of ischemic index using ultra-widefield fluorescein angiography in patients with focal and diffuse recalcitrant diabetic macular edema, Am J Ophthalmol, 2013;155:1038–44. 22. 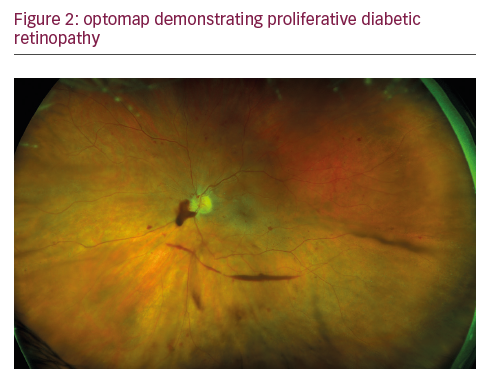 Silva PS, Cavallerano JD, Haddad NMN, et al., Peripheral lesions identified on ultrawide field imaging predict increased risk of diabetic retinopathy progression over 4 years, Ophthalmology, 2015;122:949-56. 23. 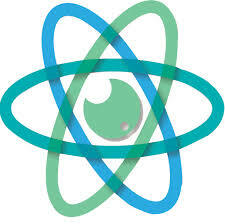 DRCR.net Protocol. Available at: http://drcrnet.jaeb.org/Studies. aspx?RecID=239 (accessed March 31, 2017). 24. Brown DM, Nguyen QD, Marcus DM, et al., Long-term outcomes of ranibizumab therapy for diabetic macular edema: The 36-month results from two phase III trials (RISE and RIDE), Ophthalmology, 2013;120:2013–22. 25. Kim DY, Kim J-G, Kim JY, et al., Ultra-widefield fluorescein angiographic findings in patients with recurrent vitreous hemorrhage after diabetic vitrectomy, Invest Ophthalmol Vis Sci, 2014;55:7040–6. 26. Levin AM, Rusu I, Orlin A, et al., Retinal reperfusion in diabetic retinopathy following treatment with anti-VEGF intravitreal injections, Clinical Ophthalmology, 2017;11:193–200.